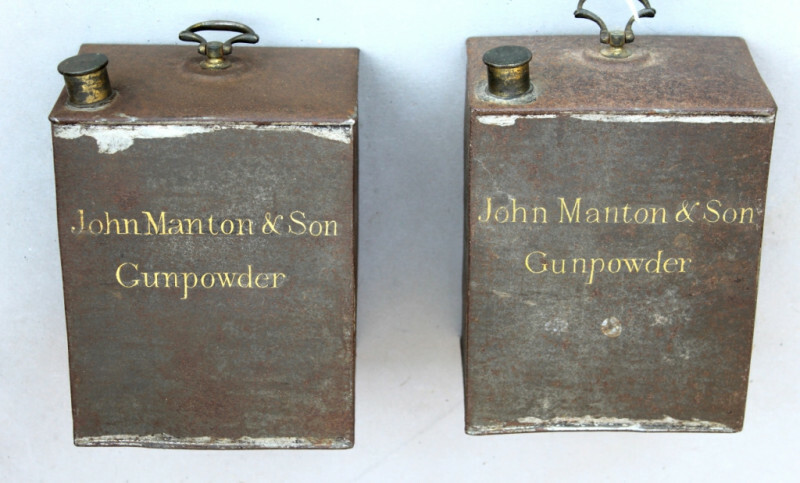 Offered for sale a fine and rare pair of antique planished tin powder magazines, marked in gold lettering to John Manton & Son “Gun Powder” with brass handles and screw caps. Overall in good condition for age but with some corrosion to the tops; the cans are sound with no holes or thin spots. Manton marked cans are increasingly rare and sought after; these would appear not to have been housed in a mahogany magazine which is the commoner way to find them, they are also slightly larger than specimens that we have seen housed in a Manton box.